Ever since I released How To Create Positive Change in 21 Days, I had read it many times. I do not recommend this book as an author but as a reader and as a person who lived a vulnerable life for a few years; a life where I forgot myself, my goals. I reached a point where I compromised my self-esteem; my confidence level deteriorated with every blink of the eye. I kept my goals on the back burner while finding excuses in the moments. I had ‘N’ number of ideas to start up a work of my interest but the excuses overpowered me. Back in 2016, I began writing my first book, which is still not complete; however, you can read one of the chapters I had shared on my blog. The idea of getting my writings recognised, the idea of getting my voice to reach people like me, kept me going forward. It wasn’t too long to realise what I was going through. Meanwhile, I started reading about what successful people do. I started to read the positives and negatives, and in the process, I came across the 21-day challenge people would take to initiate developing a habit. It’s true unless you are highly motivated and have a strong will power even 365 days won’t be enough to create a habit. No book can teach you or guide you until you are willing to bring that positive change. I decided to take up the 21-day challenge and develop the habit of getting up early. Why was it important to me? Because I was always the one who would sleep late, or would stay awake the entire night doing all those important and not-so-important works. It resulted in waking up late the following morning, which further led to a disoriented day. I know many of you would agree to this. When you wake up early, you really get time for yourself, and you get time to plan the day ahead. If not so, at least you learn how to focus on important things first. While taking up the challenge, to make it fun, I named my mission Wake Up, Now Is The Time (#WUNITT) and started posting about my mission on Instagram with sometimes quotes from celebrities and sometimes the quotes which I had written in the process. I started to share my experiences from Day 1 to Day 21 on my blog. It was Day 15th that I realised I had developed the habit of waking up as early as 4 am, even before my alarm clock rang. But the question ‘what to do next’ made me think of my goals and my aims. I took the opportunity to write down what is my aim in this life and how can I fulfil it. I wrote all the long-term and short-term goals. When it was Day 21 of my mission #WUNITT I was clear in mind what I would be doing next. The book How To Create Positive Change in 21 Days is the result of the same. It’s written to give you that “one push” you require to keep your foot forward towards your aim. I have shared how it’s better to be diligent than to be lousy self, and how you can beat any obstacles in life by implementing things gradually, “one step at a time”. 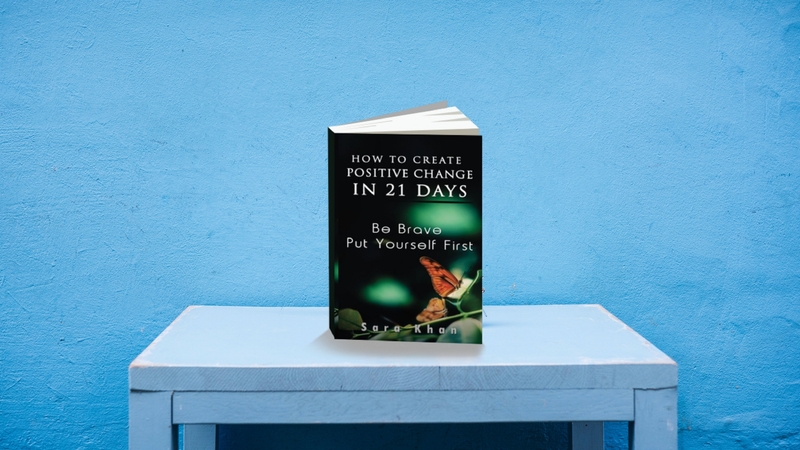 The non-fiction self-help book How To Create Positive Change in 21 Days is the practical approach to bring out the best version of yourself you could be.